This article is about culinary, medicinal, and spiritual herbs. 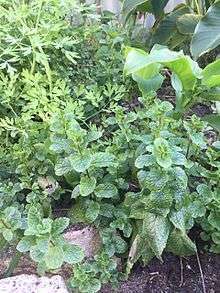 For the technical usage, see herbaceous plant. For other uses, see Herb (disambiguation). In general use, herbs are any plants used for food, flavoring, medicine, or fragrances for their savory or aromatic properties. Culinary use typically distinguishes herbs from spices. Herbs refer to the leafy green or flowering parts of a plant (either fresh or dried), while spices are produced from other parts of the plant (usually dried), including seeds, berries, bark, roots and fruits. In botanical English, the word "herb" is also used as a synonym of "herbaceous plant". Herbs have a variety of uses including culinary, medicinal, and in some cases, spiritual. General usage of the term "herb" differs between culinary herbs and medicinal herbs. In medicinal or spiritual use any of the parts of the plant might be considered "herbs", including leaves, roots, flowers, seeds, root bark, inner bark (and cambium), resin and pericarp. The word "herb" is pronounced /ˈhɜːrb/ in the UK, but /ˈɜːrb/ is common among North American speakers and those from other regions where h-dropping occurs. As far back as 5000 BCE, Sumerians used herbs in medicine. Ancient Egyptians used fennel, coriander and thyme around 1555 BCE. In ancient Greece, in 162 CE, a physician by the name of Galen was known for concocting complicated herbal remedies that contained up to 100 ingredients. Herbs can be perennials such as thyme or lavender, biennials such as parsley, or annuals like basil. Perennial herbs can be shrubs such as rosemary, Rosmarinus officinalis, or trees such as bay laurel, Laurus nobilis – this contrasts with botanical herbs, which by definition cannot be woody plants. Some plants are used as both herbs and spices, such as dill weed and dill seed or coriander leaves and seeds. 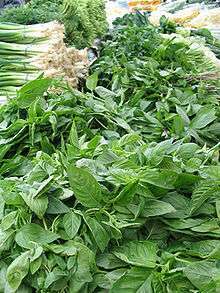 Also, there are some herbs such as those in the mint family that are used for both culinary and medicinal purposes. Herbs are used in many religions. For example, myrrh (Commiphora myrrha) and frankincense (Boswellia species) in Hellenistic religion, the nine herbs charm in Anglo-Saxon paganism, neem (Azadirachta indica) leaves, bael (Aegele marmelos) leaves, holy basil or tulsi (Ocimum tenuiflorum), turmeric or "haldi" (Curcuma longa), cannabis in Hinduism, and white sage in Wicca. Rastafari also consider cannabis to be a holy plant. The use of herbal cosmetics dates back to around six centuries ago in the European and Western countries. Mixtures and pastes were often concocted to whiten the face. During the 1940s, herbal cosmetics took a turn with the emerging red lipstick color, with every year gaining a more intense red. Herbal cosmetics come in many forms, such as face creams, scrubs, lipstick, natural fragrances, and body oils. ↑ "Chinese Herbal Medicine". Retrieved 2007-12-19.